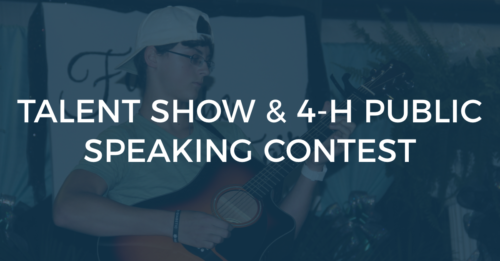 The Talent Show and 4-H Public Speaking Contest at the Smith County Fair will be held inside the Smith County Ag Center at 7:00 p.m. on Friday, July 6. The Talent Show is open to Smith County Residents only. The entry deadline is Monday, July 2, 2018. Entry forms can be found inside the Smith County Fair Program. Acts can be musical, dance, comedy, etc. Contestants must be amateurs – no professional musicians/artists may perform. Contestants must perform one entire selection. All Contestants must not exceed five (5) minutes. No guns, knives, sharp objects, fire, smoke or smoke effect(s) will be allowed on stage during the talent contest. Entries will be divided into three (3) categories. If recorded music is to be used, it must be on CD. No CD may have the lead singer on it at all. Background voices cannot exceed more than 50% of the recording. There must be ample time for judges to hear the contestant’s voice with absolutely no “voice over.” Judges have the final say on this ruling. Any misconduct or use of profane language on the part of the contestant, parent, or instructor is prohibited. Unsportsman-like behavior is not allowed. Violation of this rule will result in elimination. PLEASE keep the performance family oriented. Talent Show Chairperson has sole discretion to refuse any act. Spectators may not stand in front of or directly behind the judges during a performance. Entry and performance constitutes compliance with, and acceptance of, the 2018 Talent Show Regulations. EVERY contestant must complete a Release and Indemnity Form. 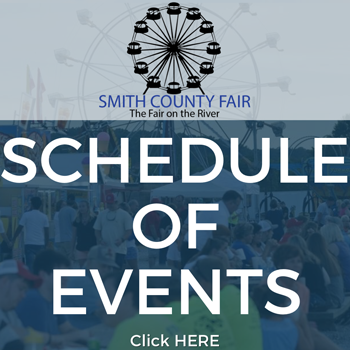 Smith County Fair and the Talent Show committee reserve the right to amend the rules and regulations as necessary, as well as accept any entry desiring participation in the Talent Show. Decisions of the Talent Show Committee are to be adhered to fully. Failure to comply with ALL written or verbal rules and regulations shall constitute grounds for non-participation in the 2018 Talent Show. Contestants will be judged for their showmanship, talent, crowd appeal, and overall performance. Talent Show winners will be announced after the Talent competition. Prizes will be awarded to first, second, and third place in each category. This year, the 4-H Public Speaking Contest will be held for the first time in conjunction with the Smith County Fair Talent show. The Talent Show and the 4-H Public Speaking Contest will both be on the indoor stage in the Ag Center beginning at 7:00 PM. We will alternate divisions of the talent show and divisions of the speaking contest to give more variety to the event. There will be separate awards for the Talent Show Winners and the 4-H Public Speaking Contest Winners. Deadline to enter is Monday, July 2, 2018 at 6:00 p.m. There will be prizes for 1st, 2nd and 3rd place in each division. No extemporaneous speeches will be required for Sr. Level participants. • If the 4-H member goes over the time limit, 1 point will be deducted for every 30 seconds. • If the 4-H member is under the required time limit, 5 points will be deducted. If you have any questions, please call the 4-H Office at (615) 735-2900 or (615)735-1551. The Public Speaking Contest is sponsored by Smith County 4-H Clubs.